November 2016 Gemini Horoscope predicts that both your career planet Neptune and planet Uranus have started their forward journey this month. You should focus on your career growth in November 2016. By this time your family life would have become more stable and your body, mind and soul stability would have been achieved. In November 2016, social grace and skills are necessary for the Gemini born people to accomplish their life goals. Personal enterprise and assertion will not be helpful. You have to be flexible and keep the happiness of other people in mind. The Twins have to make compromises, and working with others will become a necessity. The Gemini 2016 November astrology forecasts suggest that if you are searching for a job, you will have excellent openings throughout November 2016. There will be frenzied activity at the work place and you have to put in your best effort. You can base your career and business development on emotional strength attained earlier. The Gemini monthly prediction for November 2016 foretells that monetary situation will be normal this month. Earnings come through speculations by taking calculated risks. Your financial perception will be excellent. Money can be made in November 2016 by being innovative and focusing on creative subjects. Children will contribute to the generation of wealth with their bright thoughts. This period will be wonderful for prosperity and abundance. The 2016 romance horoscope predicts that love will be superb this month for the Gemini zodiac sign with the helpful aspect of Venus. People already in committed relationships will get married. There will be plenty of social activities and partying with your spouse or lover. Single Gemini in love will get many romantic opportunities and will be able to charm their lovers easily. You will be forceful in dating people you love. Love can be found while pursuing your career or health. You can also search for love in social functions and religious places. Married couples will lead a blissful life and will be blessed with the news of a baby if they are planning to have one. Gemini sexuality will undergo a wonderful change and will be passionately exciting. 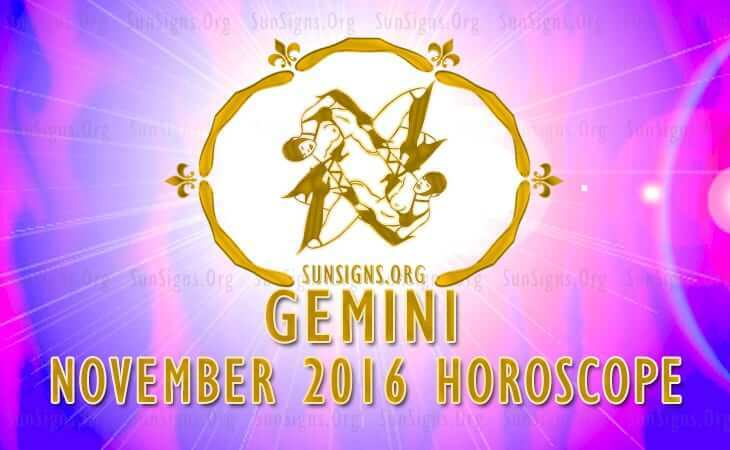 The Gemini health will be normal during November 2016. You should reduce your work schedules and rest sufficiently. Your awareness about health will naturally enhance your fitness. Regular exercise and good diet will be important. You will be enthusiastic about rigorous work outs combined with healthy food. Your main interest will be in looking more appealing to others. Overall the Gemini November 2016 horoscope predicts excellent growth in career and business with total support from your family.